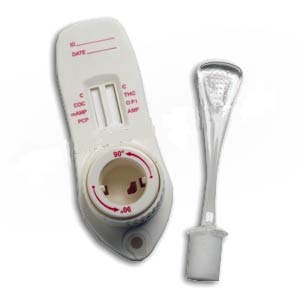 Q: What drugs does a Hair Drug Test screen for? A: A typical Hair Drug Test will screen for five different drug classes: Cocaine (cocaine & benzoylecgonine), Marijuana (THC-COOH), Opiates (Codeine, Morphine & 6-monacteyl morphine), Amphetamines (Meth/amphetamines & Ecstasy) and Phencyclidine (PCP, angel dust). Q: How many hairs are required for laboratory testing? A: Approximately 40-50 strands cut from the scalp line at the crown (or when bundled, about the diameter of a shoelace tip). Q: What time period does a Hair Drug Test test cover? A: Hair Drug tests will detect drugs for a period of 90 days. The test requires a hair sample of 1.5 inches in length. Each 0.5 inch represents 30 days. The hair sample must be cut as close to the scalp as possible and only the most recent 1.5 inches are tested. A: There are 2 options: one have professional collect the hair sample or two, collect the hair sample yourself. If you choose option two, follow these simple instructions: Using the detailed instructions as a guide, collect a hair sample of approximately the diameter of a shoelace tip. Once you have collected the hair sample, record the Specimen ID number found on the CCF (chain and custody form). Keep this number, for this is how you will be able to get your results (based on the CCF Specimen ID). Each Hair Test collection kit come with complete instructions. Mail the hair sample to the CLIA certified laboratory, Omega Laboratories, Inc, using the pre-addressed, prepaid envelope provided. The laboratory will analyze the hair sample for evidence of drug use. You will receive you test results by the method you chose when you purchased your test. If you have not received your results within 3 business days of the Lab's receipt of the hair sample, contact us by phone at 801-596-2709. Q: What if a sample of very long hair is submitted, will the laboratory test show drug use for a longer historical period? A: No. The laboratory only considers the first 1.5" of hair from the root end. If a longer sample is sent, the laboratory cuts the hair to 1.5" to conform to the 90 day historical time period. Q: What if a historical period of 6 months of drug use is required, can the laboratory test for that? A: Yes. However two separate testing kits would have to be purchased and two separate hair samples be submitted for laboratory processing. The length of the hair would have to start out at a minimum of 3 inches in length from the root end. One sample would then be submitted cut at 1.5" from the root end for the first test kit, and the second sample representing the remaining hair length be submitted for the second test kit. It is extremely important to place the root end, or the end closest to the root end aligned properly in the foil as described in the kit instructions. Q: Is the processing Laboratory Accredited? A: Omega Laboratories is accredited by the Clinical Laboratory Improvement Amendments (CLIA) and all tests are supervised, reviewed and approved by Ph.D. staff scientists. Omega Laboratories have performed over 1.5 million hair tests. Q: How fast does head hair grow? A: Studies indicate that head hair grows on average of 0.5 inches (1.3cm) per month. This growth rate varies slightly (estimated at 0.2 cm per month), consequently there is some (1 week) time variation possible. Head and body hair do not grow at the same rate; body hair grows at a much slower rate. A: It takes approximately 4-5 days from the time of drug use for the affected hair to grow above the scalp. Body hair growth rates are generally slower and cannot be utilized to determine a specific timeframe of drug use. Therefore any positive result from body hair would only correlate to drug use at some indeterminable time (generally within one year). A: Hair can be collected from several head locations and combined to obtain the required amount of hair. If the head hair is too short, body hair can be used as a substitute. If body hair is used the timeframe represented by the test is approximately one year due to the different growth pattern in hair below the neck. NOTE: DO NOT mix head and body hair for sample submission. A: The minimum time period is approximately one month (0.5 inch). Q: Does external exposure to certain drugs, like Marijuana or crack smoke, affect the hair test results? A: No. To rule out the possibility of external contamination, Hair Drug Testing looks for both parent & metabolite (bi-product) of drug usage. Drug metabolites can only be present as the result of direct consumption or intake into the body. For Marijuana analysis, the laboratory detects only the metabolite (THC-COOH). This metabolite is only produced by the body and cannot be an environmental contaminant. Q: Can hair be affected by cross-reacting substances such as over-the-counter medications? A: Enzyme-immunoassay antibodies (EIA), similar to those used to test urine, are used for the initial drug screening in hair; therefore the potential for substances such as over-the-counter medications to cause a false positive screening result does exist. To eliminate the possibility of reporting a false-positive result due to cross-reactivity, our laboratory performs Gas Chromatography Mass Spectrometry (GC/MS) for all specimens that screen positive. Q: Does hair color affect results? A: Hair color is determined by the amount of melanin in the hair. It has been shown experimentally, through actual hair samples, as well as determined in court, that hair color has NO basis in fact. A: Commonly used hair procedures (e.g., shampoos, conditioners, sprays, mousses and gels) have no significant effect on results. In fact, normal hair washing helps to remove external contamination. Normal hair treatments such as bleaching, permanent waving and dyeing generally will not significantly lower the quantitative results. If the protein matrix of the hair has been damaged to the point of breaking (cortex damage) the level of drug can be significantly affected. However, severely treated or damaged hair can be readily identified from the wash ratios and/or staining procedure. Q: What about the DETOX shampoos and other masking agents sold on the internet...do they work? A: The Hair Drug Test Laboratory tests the molecules embedded in the hair shaft. Therefore no external or topical source or agent can alter the test results. None of the so-called detoxifying shampoos or products can alter a forensic hair test performed in a laboratory, and therefore the hair drug analysis test is basically cheat proof. Q: Is the Hair Drug Test laboratory able to distinguish between d and L methamphetamine? A: L methamphetamine can be found in Vick's inhalers, as opposed to d methamphetamine, which is found only in the controlled substance. The lab has the capability to distinguish between d and l methamphetamine in hair. This distinction clearly becomes important when an individual contests a positive methamphetamine result, and allows the lab to certify a result with certainty. Q: Can hair collected from a hairbrush be used? A: Yes, but this is not recommended. We do not recommend taking a hair sample from a brush or any other source (e.g. pillow, clothing) as the sample may be contaminated and there is no guarantee that the hair is from the person being tested. Additionally, this would destroy any legal validity of the test results as proper chain of custody could not be established. If the test results are for solely for informational purposes only and not intended to be used legally (e.g. Parent testing their child). and further that the above risks are acceptable, hair taken from a hairbrush may be tested as long as the sample quantity and length is sufficient as specified in the test instructions. However, it must be stated clearly that the laboratory may reject a hair sample if it is not collected and prepared as per the test instructions. No refunds are available if the laboratory rejects the sample. Q: How does our Hair Drug Test compare to urinalysis or saliva tests on the market? A: The primary differences are historical use (approximately 90 days dependent on hair length) and the inability to tamper or contaminate the test and therefore directly change the test results. Cocaine, Methamphetamine, Opiates and Phencyclidine are rapidly excreted and usually undetectable in urine 72 hours after use, and in saliva 48 hours after use. The detection period for hair is limited only by the length of the hair sample and is approximately 90 days. Q: How effective is Hair Testing in detecting drug users? A: In side-by-side comparison studies with urinalysis, hair drug testing has uncovered significantly more drug use. In two independent studies, hair drug testing uncovered 5 to 10 times as many drug users as urinalysis for evidence of drug use. Q: How long will it take to receive the results? A: We know it is important that our customers receive results as quickly as possible. Our Hair Drug Testing lab has the fastest turnaround time for hair testing. Using the shipping label included in the standard kit, the laboratory will receive the sample in the the normal time required for first class mail. Using the Fedex shipping label included in the Express kit, the laboratory will receive the sample the next business day. Tests results are generally available 2 business days after the sample has been received by the laboratory. Q: How will I read the results? A: The results will indicate a positive or negative result for each drug class. In addition, when a donor tests positive, the result will provide an assessment of hair dose response to identify whether the donor is a low (occasional), medium (weekend, daily) or high (constant) user. Q: What are the positive result quantitative range guidelines for determining type of user? A: Yes. A report of test results can be downloaded and printed online directly from the laboratory. Have a question that you can't find the answer for? We can help! Friendly professionals ready to help.